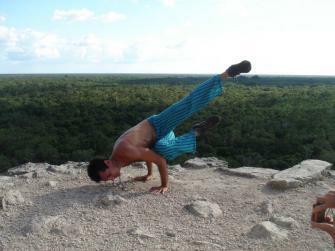 It’s being a while since our guests visiting Sandos Caracol or Sandos Playacar can practice yoga during their stay. It’s common both amateurs and experts like to keep up with their yoga practices during their vacations. But when they go to one of Juan Carlos’ classes, it turns into something of a whole new level. This is why we wanted to get to know him a little better and finally discover who’s this person which everyone seems to adore. 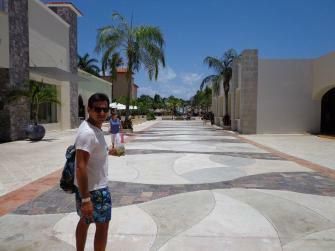 Juan Carlos arrived to Playa del Carmen 9 years ago from Mexico city. He wanted to spend the summer vacation with his girlfriend who also practiced yoga by that time and invited him to try it along with her…. 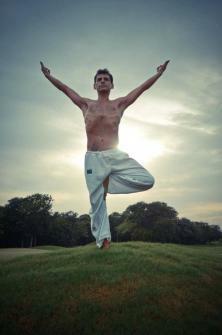 since his first contact with yoga, full of vibrations and deep breathings, he knew yoga was for him. In fact, he practically stayed in town right after earning his yoga certification and started looking for a job in Playa del Carmen. Just like that, he fell in love so much with this practice that he left his life in Mexico city behind to get into the yoga world full time. Today, Juan Carlos has lost lots of weight and has changed many aspects in his life, mainly thanks to yoga. And during these 9 years he has understood nutrition better, finding that “balance” that everybody is always looking for. 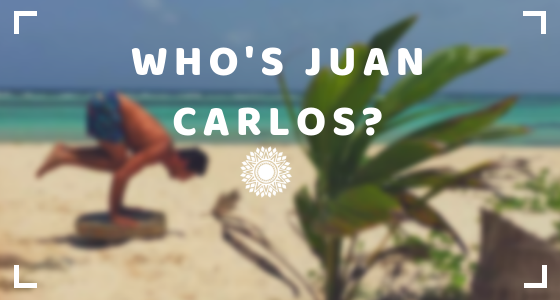 After a year of introducing yoga to his life, Juan Carlos started looking for jobs related to it, until he finally got to Sandos Caracol. We know he loves walking around the mangroves, the green landscape, and the whole eco concept which exhales peace and definitely adds to the guests that practice yoga during their vacations in Playa del Carmen. After 8 years, Juan Carlos now has taught dozens of guests from around the world. 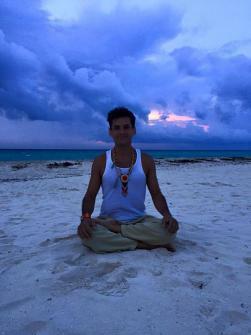 For him this is a great satisfacion, as connecting with other people during yoga is magical, since you get to feel the unique vibration each person has. 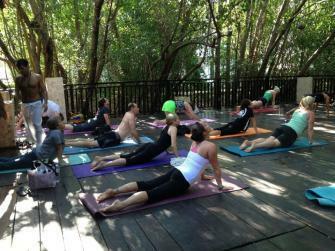 In Sandos Caracol, yoga lessons are in the morning at 9 am in the Racoon bar’s terrace, in front of a river with dozens of trees as witnesses. Remember, you don’t need to book your spot to take the class, pu just need to arrive to Spa del Mar 10 minutes before the class starts, and you’ll meet Juan Carlos and then guide you to the class spot. In Sandos Playacar the yoga lessons are at 11 am in a spot near the beach. The ocean breeze and that sensation of freedom are always present. The meet up for the class is also at the resort’s Spa. Juan Carlos has modified his lifestile a lot. Not everything is yoga, and as we mentioned before, he used to be overweight, and it is thanks to his daily yoga routine, that he has overome this, as well as some other things. In fact, something that defines Juan Carlos is his understanding when choosing his food. He does not eat any animals but fish, and in very few portions, he prefers a more vegan approach for his diet (he loves Salvia’s vegan pozole). In his personal opinion, our own body’s energy changes a lot when eating animal proteins. In fact, he affirms that by consuming what mother nature gives us to eat natually (like simple, grains, fruits, seeds), is the best way to be and feel completely balanced. It’s true, it seems there’s not a lot to do in Playa del Carmen outside going to the beach, but that’s not completely true. Juan Carlos loves going to concerts, theater plays, and musical shows where you can enjoy music, dances, colors and great vibes. 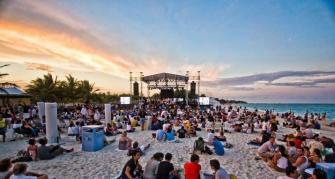 In fact, he invites each guest and future guests of Sandos to ask the resort’s concierges or hotel staff about important entertainment shows happening in Playa del Carmen, Riviera Maya or Cancún, since there’s always something nice to do. Juan Carlos and his contagious great vibes can certainly change your perspective, not only of yoga but also about life, from the moment you meet him… so we offer you a word of advice: be sure not to miss his popular yoga lessons on your next visi to Sandos, and if you have already taken his yoga sessions, let us know… did you enjoyed them?